Get your organic on and pay a visit to Macquariedale Organic Wines, now at two great Hunter Valley locations! 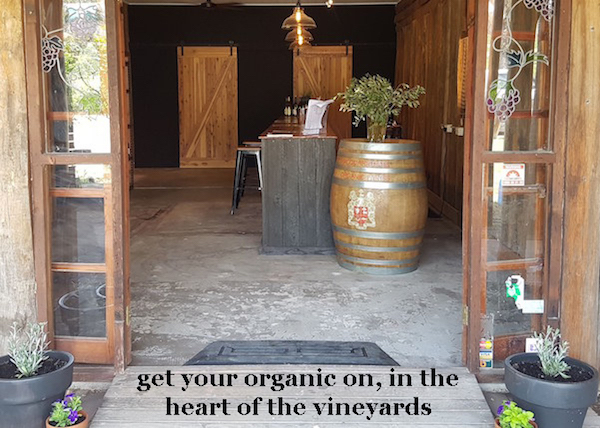 In addition to their estate Cellar Door in Rothbury, Macquariedale Organic Wines has just opened the doors to their second Cellar Door in the heart of Pokolbin, on the corner of McDonalds Rd and Pokolbin Mountains Rd. And, so you can double your organic experience, they’re conveniently located right next to Nanna Kerr’s Kitchen who offer organic snacks, meals and drinks all day. Macquariedale Organic Wines has a great range to taste, from the delightful Emma’s Bubbles, made in the traditional way of course, to whites, reds and dessert wines. You’ll also discover a selection of organic produce including coffee, olives and even eggs, fresh from the estate’s farm. Pop in for a fun and informative tasting with Ross, Derice or one of their friendly staff and discover the taste and health benefits of organic and biodynamic wine. You’ll not be disappointed!